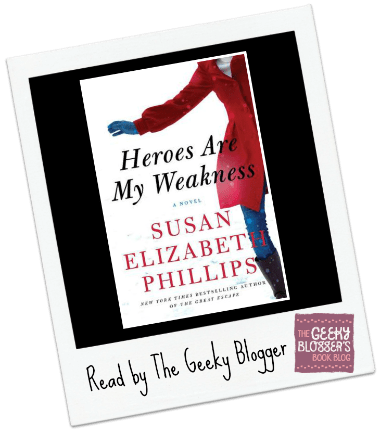 First Thought when Finished: The mystery, pacing, and style of Heroes Are My Weakness by Susan Elizabeth Phillips was outstanding but the romance just didn’t do it for me. Quick Thoughts: I picked up this book because we picked it as the Contemporary Romance read for our Cover Girls Bookclub in August. I wasn’t disappointed in the mystery or pacing. I thought the story flowed well (the backstory mystery and current mystery meshed well together) and the characters were interesting (leads and side characters). Notice I said interesting but not overly likable. I really never warmed up to Theo or Annie so that made it hard to root for their romance. While their backstory played into that. I felt it was more how they dealt with each other in current time that had the bigger impact on my feelings. Hard to love a romance when you don’t really want the romantic leads to be together. All in all I would say this was a solid read and mystery wise a hit. The romance didn’t work for me but that is not to say it won’t work for you. This has a very gothic feel (which I loved) and the setting was unique. Give this a whirl–you may love Theo and Annie together! Thank you so much for hosting HEROES ARE MY WEAKNESS!! 🙂 Good luck on the rest of the tour! It was fun! I love romantic suspense / thriller / mystery stories, but as you said, I do need to kind of root for the couple to actually be together… Great review! It’s so hard to love a book when you’re not rooting for the couple though. That’s when the “fair” reviews come in. I’ve written my fair share, too! Oh the setting is fantastic. The characters are fantastic! The mystery is very good 🙂 I think you will like it especially if you know the type of area. It would be like me reading of New Orleans. Fair review. I read and enjoyed it, it just had that edge of difference and I too liked the gothic feel to it. YEAH! I always love when someone likes a book better than me 🙂 I did love the setting! Yea, that doesn’t sound good for me. If I pick up a romance book, then that is the one area it shouldn’t falter for me. Glad you still found enjoyment in the book. Some people loved the romance–I just think it took to long to get past a certain point to accept them as a couple. The rest was pretty darn good! I actually think you would love it! I have this one on my library audio wish list. It’s definitely hard to love a romance when the main couple is underwhelming Felicia! That’s too bad, but at least the mystery element was a highlight!